If Tech Tool Store does not have all the tools you need, you can quickly create the ones that are missing. After creating your tools, you can edit them the same way as you created them. Tools created by you are displayed in a special group at the top of the list, named My own tools. They behave exactly like the built-in tools: They can be updated, executed, uninstalled, hidden, etc. They can even have their own icons. Each tool can download a file from the internet using several methods, run up to four commands plus an extra uninstall command, have an associated description tooltip, website URL and icon. And all this can be set in just a few seconds. In order to add a new tool, you need to press Add tools, in the left pane. If you want to edit an existing tool, right-click it in the list, to bring up the context menu, and select Edit this tool. In any case, you will be presented with an overlay dialog box, containing four tabs. Tech Tool Store supports all Windows environment variables such as %windir%, %systemroot%, %userprofile%, %temp%, %systemdrive%, %allusersprofile%, %programfiles%, %comspec%, %appdata%, etc. (all case insensitive). %CommonDocs% Path of the common documents folder. %SysWOWDir% For 64 bits Windows, it is C:\Windows\SysWOW64. %ToolsDir%\Folder name\Program name.exe /parameter1 "Parammeter with white spaces"
%SystemDir%\cmd.exe takkill /f /im "Program name.exe"
cmd.exe rd /s /q "Folder full path"
As you can see from the examples above, parameters containing white spaces must be enclosed with double quotes. This applies to expanded environment variables. For instance, a parameter containing %ToolsDir% must always be enclosed with double quotes, because Tech tool store tools contains several white spaces. TTS also supports commands to open files, and even with extra command line parameters. You can also make use of this feature to open internet locations and other protocols. For instance, you can create an app that opens one or several internet pages. Tutorials, for instance. You just need to set the URL of the page as the command. Or you can make use of the mailto protocol to create tools that email your clients. Or you can make your apps open local documents, such as MS office docs, text files, or PDF docs, by simply specifying the path of the document itself, which will be opened with the default application in the current PC. In this tab you can specify the name of your new tool, and optionally the download URLs, if your tool downloads a file. This tab will look like the picture below. In this tutorial, we will be showing all the steps needed to add a nice tool: Virtuoz Virtual Desktop. A quick google search gave us the program's page, which is this one. That page provided all the details we needed for our new tool, so it was basically a very fast copy/paste operation. So we start by entering the name of the new tool. If you are editing a tool, you can edit its name by modifying this field. If you select Use "Download 2" in case "Download 1" fails, which is selected by fefault, then the second download only if the first one fails. Also you can not specify a file for the Download 2. Both downloads use the same file. When in Update only mode (you press Update selected), both downloads are performed. You will want to download both files and heave them ready to run later in any other computer. When in Update and run mode (you press Update and run selected or double-click the tool), only the tool's version corresponding to the acual OS bit wil be downloaded. Otherwise, if you select Always perform both "Download 1" and "Download 2", then both downloadds will allways be performed, regardless of the current OS arch. You need to specify a different file name for each download. If the downloaded file is a zip archive, then you probably want TTS to automatically extract it for you. In that case, tick If the downloaded file is a zip file, extract it to a same named folder. In the current example, we are using this option. So, when the download ends, the contents of %ToolsDir%\Virtuoz.zip will be extracted to %ToolsDir%\Virtuoz\ The folder is automatically created, and the zip file is automatically deleted upon successful extraction, to save you some storage space. Direct download: This is the easiest method. You just have to specify the download url. The inconvenient of this method is that not all programs have a constant download url. For instance UVK has a constant download url (http://www.carifred.com/uvk/UVKSetup.exe), but for some other programs, the url changes each time a new version is released, i.e. http://www.example.com/program_1.1.exe, then http://www.example.com/program_1.2.exe, and so on. Also, some web pages provide a temporary download url, which will only last a few minutes. This is when the other download methods become useful. Parse link text: To use this method, you need to find a web page that has a link pointing to the updated file. The web page and the text link do not change when a new version is released, but the target url of the text link is updated each time a new version is released. This is very common. This is the method used in this example. Set the Download url field with the address of the page that contains the link, and the Link text field with the text of the link. If the link displays an image instead of text, you can specify a portion of the html code contained in the link's <a> element. This can be the link's image file name, for instance. Try to use a protion of text which is unique in the page's html code. Now have a look at your browser's address bar. You'll see the URL of this page (http://www.carifred.com/tech_tool_store/help/?page=6). Softpedia page: If none of the methods above work for you, and the program you want to download is part of the Softpedia's list of software, then you can use this method. Just google Softpedia followed by the name of the program, and you will quickly find the page, if it exists. Usually it's address is something like http://www.softpedia.com/get/[Section]/[Program's name].shtml. Then set the the Download url field with the address of that page, and select Softpedia page. Majorgeeks page: If the program you want to download is part of the Majorgeeks list of software, then you can use this method. Just google Majorgeeks followed by the name of the program, and you will quickly find the page, if it exists. Usually it's address is something like http://www.majorgeeks.com/files/details/[Program's name].html. Then set the the Download url field with the address of that page, and select Majorgeeks page. TechSpot (64 bits) or TechSpot (32 bits): These download types can be used when a program has two different downloads: One 32 bits and the other 64 bits. You just need to find the Techspot page of the desired program. You can goolge TechSpot followed by the name of the program, and you will quickly find the page, if it exists. Usually it's address is something like http://www.techspot.com/downloads/[ID and name].html. Then set the the Download url field with the address of that page, and select TechSpot (64 bits) or TechSpot (32 bits), according to the version you wish to download. In the current example, we used the Parse link text method, for the first download, and the Direct download method for the second download. Because we are downloading a zip file, we check If the downloaded file is a zip file, extract it to a same named folder. At this point, it is useful to temporarily save the tool as it is, and update it. This will download the tool's file, and, in this case, extract the zip contents to a folder having the same name as the zip file, with the the .zip (extension) stripped out. 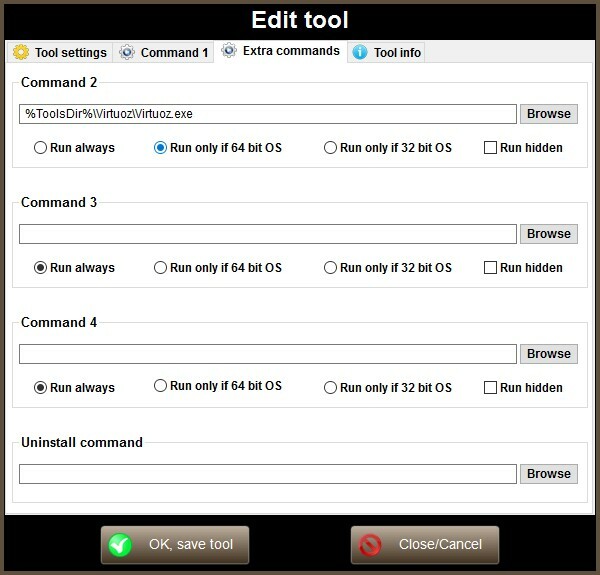 This will make it easier to set the rest of the tool's fields and the commands to run. After updating the tool, we rigt-click it and select Edit this tool, to bring up the tool editor again. We are now ready to start setting the tool's commands. Press the Command 1 tab selector. Please read about the supported environment variables and commands before reading this section. This command is specially designed to install an application. But you can, of course, use it to run whatever you want. If you don't need it, just leave it blank. This command's tab looks like the picture below. Insert the desired command in the respective text input box. The text box supports drag and drop, so if you have the file to open handy, just drag it to the text box, and it's path will be automatically set. You can also press the Browse button to locate the file to open using the Windows Shell. Paths are automatically converted to their corresponding environment variables. Select the run desired options, if any. Run always: The command will be executed, regardless of the OS architecture. Run only if 64 bit OS: The command will be executed only if Windows is 64-bit. Run only if 32 bit OS: The command will be executed only if Windows is 32-bit. This is very useful for tools that have different files for 32 and 64-bit, or if you're using the Use "Download 1" for 32-bit OS, and "Download 2" for 64-bit OS download option. Select the desired additional options for this command. Run only if the files in the commands 2,3 and 4 don't exist: Check this option if you want to skip this command if the files in the commands 2, 3 and 4 already exist. This may be useful, for instance to install an application only if it is not already installed. Run hidden. Try to hide the window created by this command: Use this option only for commands that do not require user interaction. TTS will try to hide the window created by the process spawned by the command. Select the process monitoring option for all commands. Monitor the command's procedd ID, and wait until it closes (default): Tech tool store will monitor the process spawned by each command, and wait until that process is no longer before stepping to the next command. After running each command, wait for all child processes to close: Using this option, TTS will not only monitor the command's process, but also any processes cfreated by the command itself. This is useful for packed tools, which extract to a temporary directory and then run the extracted files. Monitor commands by their process paths instead of their process IDs: Using this option, TTS will not step to the next command until there is no process running with the specified path. This is useful to monitor tools that may already be running. 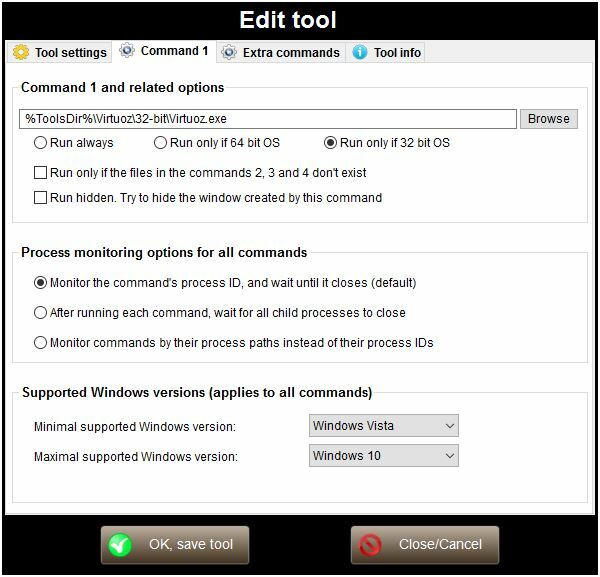 In our Virtuoz virtual desktop utility example, we set theis command as %ToolsDir%\Virtuoz\32-bit\Virtuoz.exe. If your tool does not run in all Windows versions since Windows XP up to Windows 10, then running it in unsupported Windows versions could cause errors or even damange. You can prevent that from happening by specifying the minimal and maximal supported Windows versions, by simply selecting them in the corresponding drop-down boxes. The Extra commands tab allows you to specify three more command to run, and an additional uninstall command. Enter the desired commands in the respective text boxes. Just as with the command 1, the text boxes support drag and drop of files, and you can use the Browse button to locate the file to run using the Windows Shell. Run always: The command will be executed, no matter the OS architecture. Run hidden: Use this option only for commands that do not require user interaction. TTS will try to hide the window created by the process spawned by the command. The options above are not available for the uninstall command. To easily retrieve the uninstall command of a specific program, use one of the built-in tools, such as UVK's Smart uninstaller. 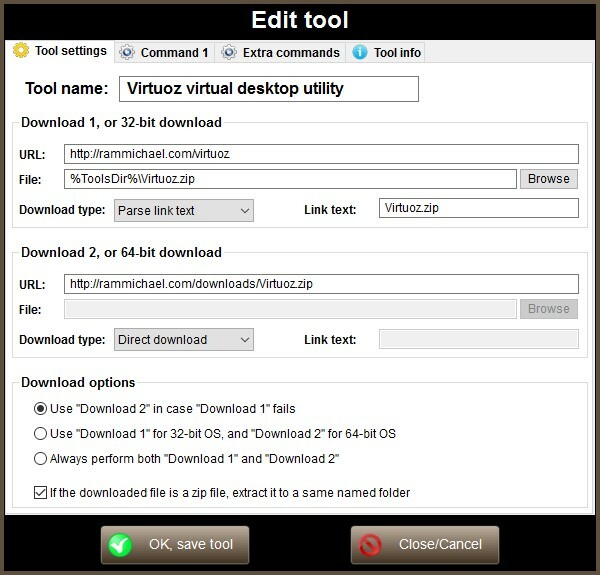 In our Virtuoz virtual desktop utility example, the tool has different executables for 32 and 64-bit Windows, so we set the corresponding options fo each file. This way, only the correct file, according to the current Windows architecture will be executed. Enter the uninstall command for this tool in the last input field. Commands can be easily copied from the Smart Uninstaller section of UVK. Just double-click the uninstall entry corresponding to the program you're automating, then copy the Uninstall string field from the Uninstall entry properties dialog box and paste in the Tech Tool Store's Uninstall Command field. 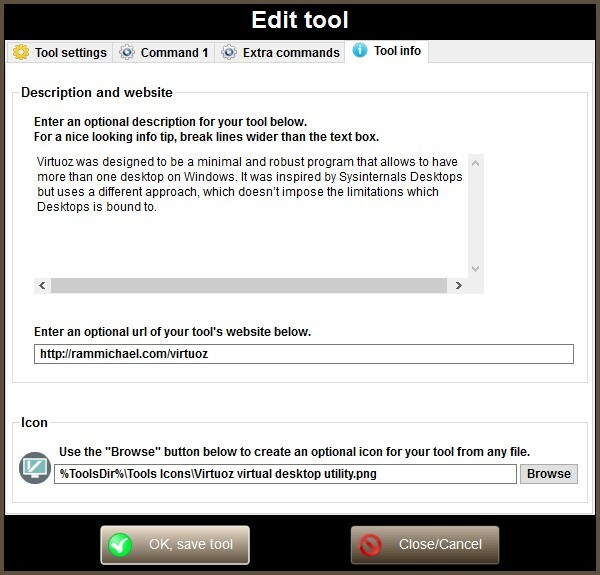 The Tool info tab allows you to specify the tool's tooltip text, website URL, and icon. All the fields in this tab are optional. Enter a quick description of your tool in the corresponding text box. In our Virtuoz virtual desktop utility example, we just copied the description directly from the author's website. This is the text that will be displayed in the tooltip when you select the tool in the list, and it is very useful to know what a tool does, among so many. Don't forget to break lines wider than the text box, for a better looking tooltip. Enter the URL of the tool's website. You will be able to quickly visit this URL later by selecting Go to this tool's website, from the list's context menu.. This may be useful if you want to update the tool's related fields later, or check its current version. Choose an icon for your tool by dragging a file to the corresponding text field, or use the Browse button to locate the file using the Windows Shell. Normaly you would choose the tool's main executable as the icon file, but you can choose any file. TTS uses the Quick Any2Ico's technology to create the icons, so it is able to generate an icon from virtually any file system object.